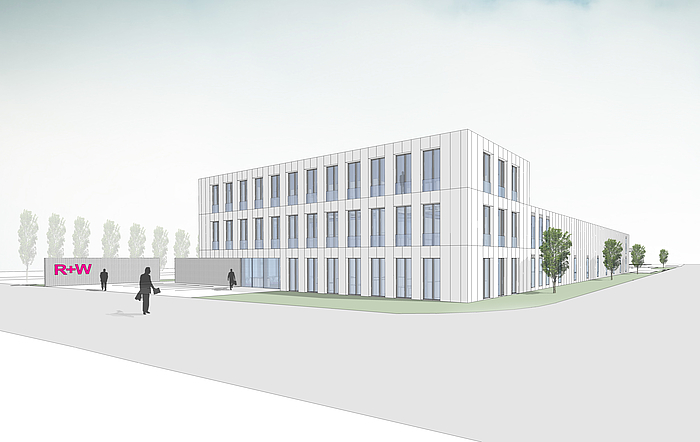 R+W, one of the leading companies in the field of industrial and precision couplings, is building its new headquarters in Wörth am Main and thus creating more space for production and administration. Only a few hundred metres from its current location, R+W has secured an area of around 6,500 square metres in the new Weidenhecken business park. The new R+W headquarters will be built here with over 2,500 square metres of production space and 1,000 square metres of office space. “The planed building will offer us ideal growth conditions due to its size and the fact that it is tailored to our needs. This will enable us to significantly increase our capacities quickly, which has become necessary due to our strong growth in recent years”, Managing Director Steffen Herter explains. The design planning for the building is complete and the building application has been submitted. Goldbeck GmbH has already been commissioned as the general contractor for construction. Thanks to Goldbeck’s considerable experience with industrial and office buildings, a very ambitious timetable was agreed on in accordance with requirements of R+W. If construction can begin in January 2019, the move into the new premises will be completed within 2019. The new location was selected in close consultation with the parent company, Poppe + Potthoff GmbH from Werther, Westphalia, Germany. With the total investment of over 8 million euros, the family-run corporate group is making a clear commitment to the location and R+W employees. The mechanical engineering industry is booming, so our way forward is clear – towards further growth. In addition to investing in the new office and production space as well as equipment, we are expanding our German and international teams and investing in product development. The existing R+W headquarters in Klingenberg am Main have become too small, despite additional leased production and office space. "The new building will allow us to optimally tailor processes and structures to our needs. By deliberately bringing the sites together and simultaneously adding to the existing production equipment, we can optimize the flow of material. This will allow us to significantly increase our efficiency and output," says Holger Vogt, Head of Operations. “At the same time, we will offer attractive workplaces and facilities to R+W employees – without a long commute due to the proximity of the current location.” Employees in focus – the SME will take ergonomic aspects into greater consideration at the new workplaces and optimize occupational safety, thus increasing investment into the health of every employee. With the move, R+W will be able to implement its strategic goals and respond to growing demand. R+W will thus remain one of the leading manufacturers of industry and precision couplings in the Bavarian Untermain region and thus strengthen the area – also as an employer!